Ronald Slye: We’re, we're getting near the end of our time. Let me . . .
RS: . . . Yes. Let me ask you, if you were speaking to a group of Rwandans today about the tribunal, what would you want them to take from the tribunal? What would you want to say to them about what the tribunal has accomplished? We have brought to account leaders that would otherwise never have been brought to account. In the last 14 years Rwanda only got one rendition. 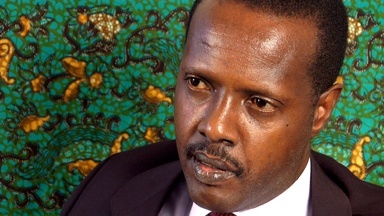 Frodouald Karamira, leader of the Hutu power faction of the MDR party was renditioned or rendered from Ethiopia. I don’t think there’s an extradition treaty. Given a fair trial and shot in, you know, in a public square. You know, so there haven’t been any extraditions to Rwanda. You have an Interpol wanted list of 93 key, you know, fugitives, all in positions of leadership. In fact actually one was picked up yesterday in Réunion. Head of the military intelligence in the office of the President, Captain Pascal Simbikangwa, you know. And – but, but, you know, Rwanda hasn’t been successful in getting, you know, its extraditions from France. Or from anywhere for that matter. So to the extent that we’ve managed in the last 12 years or so to arrest 75-plus, you know, fugitives from about 36 countries, we-, we’ve been able to neutralize or incapacitate, you know, the extremist element you know, who’d be out there if there wasn’t a tribunal, probably in the Congo trying to make a comeback, you know. But more importantly we’ve documented judicially what actually happened. I’m sure you’re aware of the denials of the Armenian genocide, you know. That’s a result of the failure of the Constantinople prosecutions after the war. We still have revisionists and deniers of the Holocaust. It’s been criminalized in several countries but deniers abound and it’s the same thing. We have puerile theories being peddled, you know, by defendants here. Denying the genocide or minimizing it. But yes, we’ve, we've, we've documented the horrors that took place. You know, even in the cases where we’ve had acquittals, it’s not so much that the events didn’t happen; it’s just either a question of poor pleading or failure to prove that a particular individual was involved. So there’s, you know, there's an historical record of what happened. And you’re contributing to this, you know, by, by capturing the heritage of the tribunal. It’s hard of course to, you know, to say much more to the Rwandans on either side of the divide. But I think, you know, I’m, I'm proud of the little we’ve accomplished a-, and the legacy we leave to, to international criminal justice; a large corpus of jurisprudence. Probably without us, the ICTR and ICTY, the ICC may never have come to life. So it was a watershed moment, the establishment of these two tribunals, for international criminal justice. And they’re not a fix-all but I think they’ve substantially contributed to the development of international criminal law. And, and y-, you have countries asserting universal jurisdiction, criminalizing these, you know, offenses and, yeah, yeah. RS: Is there anything we haven’t touched upon that you think would be useful for future generations to know about this process? Well, I’m sure you’ve talked to many people and you’ve still got many more people to talk to. I must run but if you do think of something you can always give me a shout before you leave and, yeah, yeah. RS: Okay, great, thank you very much. Thank you very much, too, yeah.